After a wacky winter, summer is finally peeking around the corner. It won’t be long until school is out and you are packing your towel to hit the beach. You can enjoy your vacation time so much more if you don’t have to worry about what body hair might be showing as you soak up the sun. While women worry about the bikini area, armpits, and legs, men feel self-conscious about chest and back hair. Don’t rely upon an inefficient razor or painful waxing sessions to seek a temporary escape from your unwanted body hair. Instead, you can begin laser hair removal treatments now in order to enjoy your results by peak beach season! Laser hair removal targets the pigment, or melanin, in each hair. As the melanin absorbs the laser’s heat energy, hair follicles become severely damaged and unable to continue the hair growth cycle. When the hair grows back, it is significantly reduced and not nearly as noticeable. Over a series of treatments, the hair loses its ability to grow back at all. Laser hair removal delivers results by gradually reducing the amount of hair that grows onto the skin. More than one appointment is necessary to achieve complete and long-lasting hair reduction. While smaller, more delicate areas of the body like the face or the armpits might respond more rapidly, larger targets like the chest and legs will require a few more appointments to fully wipe away unwanted hair. The good news is that advanced laser systems are lightning fast, painless, and surprisingly simple. You won’t need to inconvenience yourself or your schedule to get the results you want! Imagine the freedom you will feel after undergoing laser hair removal. In addition to saving time and money on shaving and waxing, you can completely eliminate chest, back, leg, armpit, and bikini area hair without ever lifting a finger. When it’s time to lay on the beach or jump in the pool, you can flaunt your body in your swimsuit with total confidence. No unsightly hair; just silky smooth skin! At the Tampa location of Hermann Wellness, Dr. Hermann uses an IPL laser hair reduction treatment for non-invasive and fast results. 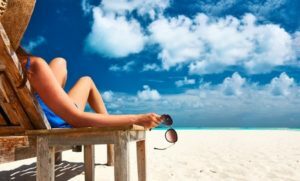 You can call (813) 773-8214 to schedule your treatment and begin the process of loving your beach season even more this year.